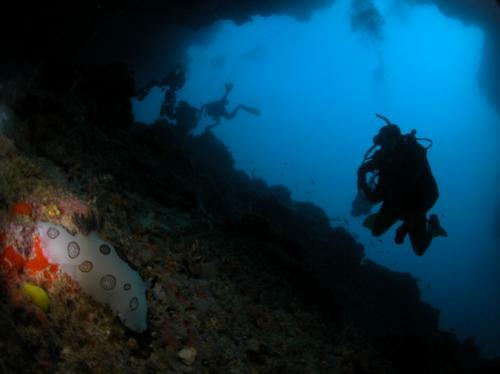 Turtle Cavern is one of the most interesting dive sites on Sipadan. Actually, it could be considered to be the island’s unique dive spot. However, diving the cavern requires special preparation and a guide helping divers to discover the inimitable charm of exploring the spot. Our dive was supervised by an experienced diving instructor from Borneo Divers, with over 20 years’ practice at diving in the area. The guide provided a detailed briefing, drew a plan of the cavern, marking any exits and narrow corridors, then proceeded to describe the main cavern chamber and a corridor descending to 25 m and leading to a smaller hall, which were our destinations. The Sipadan Cavern is one of the most famous caves in the world. It was frequently featured in different diving publications. In 1980, it was filmed by Jacques Costeau’s crew. Its popularity comes not only from the geologically unique interior, but also from the large number of turtle and dolphin skeletons; at first, it was believed that the animals came here to die at peace. The truth was different: they simply lost their way in the darkness. Unable to find an exit and inhale fresh air, turtles suffocated, and their putrefied corpses floated under the cavern roof until gases evaporated completely. 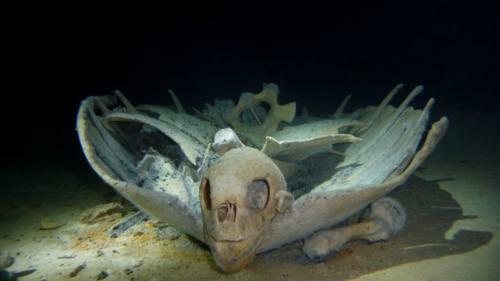 Finally, their perfectly preserved skeletons rested on the sandy bottom of the cavern, to be found by divers. As we prepared for exploration, our excitement grew. The cavern is near to the island’s shore, therefore we didn’t have to use a boat in order to get there. The entrance is at about 22 m, located in a wall descending to a depth of 1000 m. At first we spotted warning signs informing inexperienced divers of the dangers related to exploring the cavern’s dark interior without a guide. As we went into the cavern via a very large entrance with the roof ascending to 10 m, water seemed crystal clear to us. At first, the cavern’s depth dropped to almost 10m. In the first small hall with several exiting corridors, we noticed a turtle skeleton for the first time. We plodded on to the left, careful not to disturb the waters, taking the left corridor and swimming in a file, as at this point the cavern was too narrow to hold any other formation. We arrived at a place of total darkness. Suddenly, we were approached by an interesting specimen of lionfish. It seemed at home with the darkness of the cavern. After swimming several meters in a line, we finally arrived in the large cavern hall which descended to about 20m. 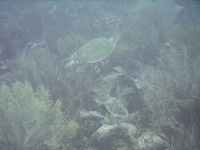 We spotted several turtle skeletons, including one partially suspended under the cave’s roof. Our guide pointed out a direct exit to the open sea, located at a depth of about 10 m. However, the passage was too small for a scuba diver in full equipment. The gigantic hall was swallowed in perfect darkness. After several minutes we turned back, to explore the second, this time smaller hall, connected by a corridor descending to 25 m on the other side of the cavern (i.e. on the right from the cavern’s entrance). Finding the way back seemed absolutely impossible. I couldn’t imagine my presence there without a guide and a back-up light. We got back to the small hall with a turtle skeleton, where we spotted a rather interesting octopus that appeared to be hunting prawn which swarmed the place. Someway to the right we saw the blue outline of the cavern exit. At some point the corridor veered downwards, and we went deeper, on the way spotting an entire marlin or dolphin skeleton, settled on a rock shelf. It was an unforgettable feeling to travel down a narrow corridor into the interior of a coral reef. As the corridor descended, we had the opportunity to admire fantastic rock formations, which seemed to suggest that that spot wasn’t always under water. We arrived at the maximum depth of 25 m and started on our way back. By the entrance we could admire the stunning view of the big, blue sea, then we spotted numerous sponge colonies, shoals of glassfish (Parapriacanthus ransonneti) and other interesting cave dwellers. After we left the cavern, we saw several turtle and wondered whether the animals were traveling in the direction of the darkness. The total dive time was 55 minutes, but after resurfacing we felt that our trip was too fast, and we could have spent another hour on discovering the life of that underwater and underground formation.